The lovely blue dome and minaret pictured belong to the Al Lawati Mosque in Muscat, the capital city of our mystery country. The mosque is a landmark in the Mutrah district of the city along the waterfront promenade or corniche. The Hajar Mountains provide a dramatic backdrop. This mystery country is Oman. Click to see Oman tours. 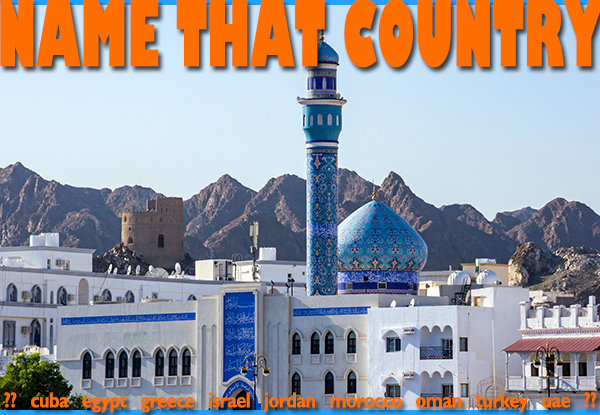 This entry was posted in name that country quiz, Oman and tagged Muscat, muttrah corniche, Oman, Oman tours by yalla2013. Bookmark the permalink.